Do you use Vine or SnapChat? Over the last year, these have become really popular social media apps. In the past, we have spoken about how to use Facebook, Twitter and YouTube (and here) to learn English. Now that we have even more apps, I'm going to look at how to use new social media to learn English. Vine is a social media video app that came out in 2013. It lets you make and share six-second video clips. Recently it became available on the web as well. Vine is really popular for making funny videos. One of the reasons it so popular is because there is a short amount of time to make a video. If you are trying to learn English using Vine, you can create short videos based on new vocabulary you have discovered, which demonstrate the new words. You can share these videos with your classmates. By now, I’m sure you have all heard of SnapChat! SnapChat is an app that lets you send a photo or video to someone that lasts only up to 10 seconds before it disappears. To practice your written English, you can take photos of objects or things you see on a daily basis and write the vocabulary on there too. You can then send to your friends and ask them to do the same. As the photo only lasts up to 10 seconds, it is a really quick way to try and remember as much vocabulary as possible! SnapChat Stories launched last year and is a way to share your day with friends. It adds Snaps together to create a narrative. This would be a great way of practicing your English speaking skills, by telling your friends what you did, while speaking in English. 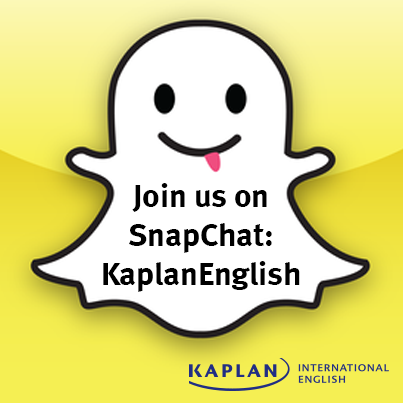 We have our own SnapChat account, KaplanEnglish. Follow us and say hi to me and Rob! Do you use Vine or SnapChat? What social media apps are popular in your country?